One day, about seven years ago, I was at Marigold Nursery. Over by the greenhouse, was a large potted cotoneaster. It was mature and had the largest berries I'd ever seen in a cotoneaster. 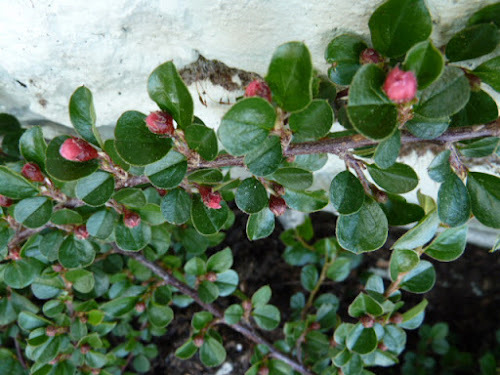 The label said Cranberry Cotoneaster. I would have loved to just buy it, but I didn't have the $75.00. There were a few berries lying on the surface of the soil. I picked up two and popped them in my pocket. When I got home I planted them in pots of soil and waited. Eventually they came up and I ended up with three plants. I had pulled some cotoneaster baby seedlings of a regular cotoneaster years before and ended up with a large flowering and berrying plant within a few years. I had no idea how much slower this one would be. It has reached about 2x3' this year. Today I noticed, for the first time, I have little flower buds and I'm very excited at the prospect of my first berries this year. I have my fingers crossed. Update: There are berries. I will take some pictures when they get larger.